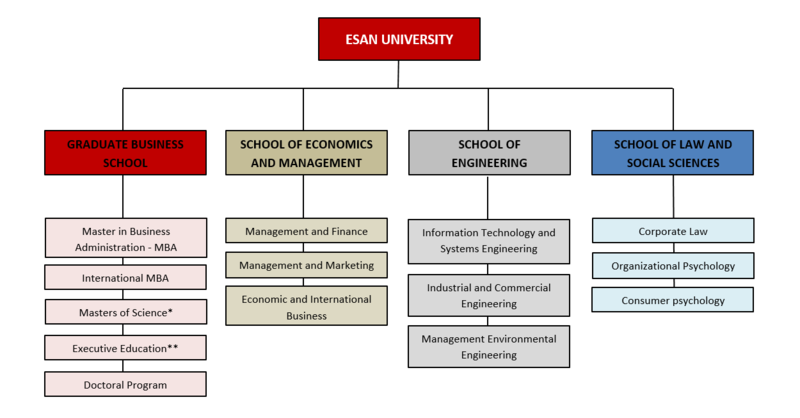 ESAN is a leading academic institution that was founded in 1963 as the first Graduate School of Business in Latin America. Throughout these years ESAN has achieved a relevant role in Peru, based on the quality of its MBA, specialized masters, executive programs, etc. Currently Universidad ESAN offers a variety of undergraduate courses from our 3 schools: Economics and Management, Engineering and Law where the fields of specialization are: Management and Marketing, Management and Finance, Economics and International Business, Information Technology and Systems Engineering, Industrial and Commercial Engineering, Environmental Management Engineering, Organizational Psychology, Consumer Psychology and Corporate law. Universidad ESAN continues to be fully immersed in an internationalization process, maintaining strategic alliances with prestigious institutions all over the world. We offer our faculty, students and alumni, new dimensions of knowledge and opportunities for professional and personal growth. * Business Master Programs: Master in Information Technology, Management Master in Finance, Master in Finance and Corporate Law, Master in Marketing, Master in Organization and Human Resources Management, Master in Supply Chain Management. Specialized Master Programs: Master in Agribusiness Management, Master in Energy Management, Master in Health Services Management, Master in Public Management, Master in Project Management, Master in Real Estate Management and Development. Research Master Programs: Master in Research in Administrative Sciences. ** We provide courses in the following areas: Management; Accounting, Finance and Economy; Marketing; Business Processes and Logistics and Information Technology.